Miley Cyrus is an often-controversial popstar with one of the biggest followings in social media. In the past, her fame was associated with negative connotations and scandal. However, recently the 25 year-old singer has been using it for the benefit of veganism, which has been her chosen cause since around 2014. 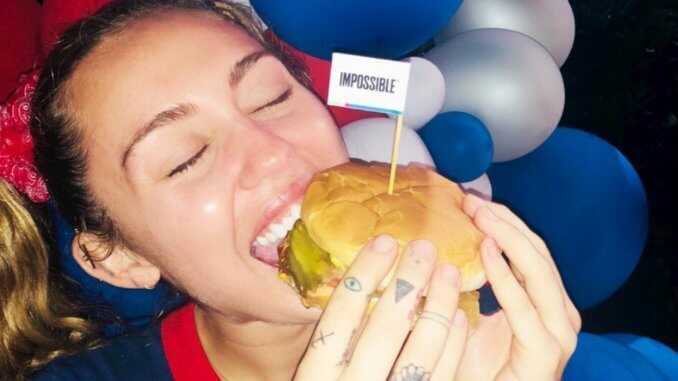 As part of the 4th July celebrations this year, the star took to her Twitter account where she has over 40 million followers, to post a photograph of herself eating an Impossible Burger. The post received more than 30,000 likes by her fans. In May this year Cyrus used her time in the spotlight at the Met Gala to promote veganism, appearing in a gown created by vegan designer Stella McCartney and saying to press, “I’m here so excited to be a part of this because I think this moment can be about so many different things, and for me I want to bring a message which is veganism and that there doesn’t have to be torture in fabulous fashion.” In November 2017 she also endorsed PETA-endorsed vegan shoe brand Collectionandco.